In this, Samara finds Tahir in a bitter mood in the aftermath of getting his divorce final. He was so absorbed in the inner demons that accosted him that he hadn’t noticed her. Samara bit her lip as she took in the unruly dark hair falling over half his forehead in disarray and the shadow darkening his jaw. More than that, it was the way he slouched in the sofa and the way his mouth was compressed in a grim bitter line as he stared into the golden liquid in the glass he held that spoke of the darkness he was sunk in. She inhaled as she tried to suppress a wave of anguish. Pain that lanced her because she could feel his pain. Feel it as her own. She’d come here, driven by an overriding conviction that he needed someone to be with him. But it took some seconds to gain control over her emotions. His gaze swung towards her, dark eyes fixing on her. She tried to keep calm as she took in the familiar attractive planes of his face, the hard jaw, the sharply angled cheekbones, the well-shaped mouth, the intense eyes. ‘What are you doing here?’ His voice was rough. ‘Is there a problem at the office? You could’ve called me. As you see, I’m in no condition to receive visitors.’ Samara caught her breath. If he only knew the effect he was having on her, in faded denims that were moulded to his body, the white shirt that was open halfway to his waist, revealing crisp dark chest hair shadowing golden skin. She dragged her gaze from his lean, muscled body that clothes could only delineate, not conceal. ‘Everything’s fine,’ she assured him quickly. ‘It’s just that you sounded so…You shouldn’t be drinking this much. It isn’t good for your health.’ Concern gave a husky edge to her appeal. ‘Health?’ He glanced at the amber liquid swirling in the narrow glass as he raised it to eye level. ‘It’s good for my mental health.’ As though to emphasize the point he downed the contents in a go. Shock ran through her in a wave. ‘Tahir, I’ve never seen you like this before…’ she protested. Samara inhaled at the unexpected pain his words evoked. His admission that his break-up had hurt him was somehow not easy to listen to. He got up. Instinctively she moved towards him as he swayed on his feet. His gaze turned to her, pinning her where she stood, warning her off. 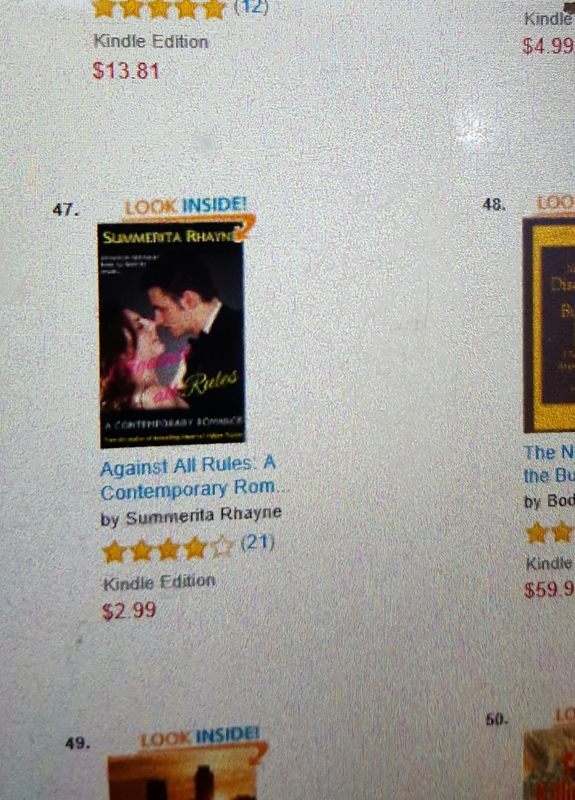 Against All Rules is a contemporary romance which is an Amazon kindle bestseller in Amazon recommended category. From July, ’15 to Jan,16, it featured steadily in the top 100 in World Literature Asian category in kindle ebooks. Currently it stands at no.47 in the same.